The Mexican artist José León Cerrillo, born in 1976 in San Luís Potosí, uses his multifaceted oeuvre to question what exactly makes a painted picture a work of art. Cerrillo examines the discursive function and the “social character” of painting by provocatively paring a picture down to a decorative pattern or by experimenting with the many different ways of presenting a picture. Cerrillo, who studied at the School of Visual Arts from 1994 to 1998 and at Columbia University in New York from 2001 to 2003, and who now lives in Mexico City, often integrates everyday objects, such as simple potted plants, into the exhibition space, or he cuts his pictures – usually painted with acrylic paint – into strips, which he then leans up against the wall side by side. His picture “Eden, Eden” (2002) is not intended to be hung on a wall; instead, it is propped up against the wall with the aid of a pedestal. By allowing wide rivulets of paint to stream down the curved pedestal onto the ground, Cerrillo questions the relationship and the boundaries between the exhibition space and the painting itself. Jose Leon Cerrillo was born in San Luís Potosí, Mexico, in 1976, José León Cerrillo earned his BFA from New York’s School of Visual Arts in 1998 and his MFA from Columbia University in 2003, and was invited to show at the Prague Biennale in his final year of graduate studies. In Cerrillo’s earlier work, he expanded and contested the field of painting by exploiting late-modernist gestures. In the 2003 installation Negociación (Alma Anémica, Sweet Aufhebung or Endless Something), the artist evokes Constantin Brâncusi’s Endless Column, which his title already suggests, by stacking plaster-cast drinking cups in tall pillars. Those columns simultaneously veil and reveal a tall abstract canvas, upon which is mounted a shelf of small potted plants — a juxtaposition that archly equates high art with household decoration. Following shows in New York and Mexico City galleries, Cerrillo was included in P.S.1’s 2005 Greater New York group survey and began exhibiting on the West Coast shortly thereafter. In his 2007 solo show at OMR Gallery in Mexico City, Futuro anterior (Future perfect), Cerrillo displayed an impressive body of new work addressing Lacanian theory and the Bauhaus aesthetic. In de and perse and, a Pantone array of geometric patterns and writing printed on wood tiles deconstructs text into purely visual symbols. The artist disrupts popular considerations of printed works as industrial or automatic by arranging multiple silk screens into a collective piece with a curator’s care and consideration. 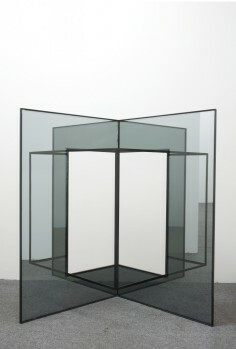 His freestanding installations, made up of metal frames, wood panels, double-sided mirrors, and Plexiglas, form semi-enclosed structures and wall dividers that effect a sense of containment and concealment. Transparencies covered in blocky abstractions draw attention to the patterns’ negative space and the unattainable interior of two-dimensionality. Though staunchly flat and geometric, Cerrillo’s work ultimately activates its viewers, placing them in center stage through a mise-en-scène approach that’s both visually playful and a profound mediation of modernist aesthetics.